Mylescars is India's first self-drive car rental service. You can choose from over 38 car models in more than 250 locations in 21 cities. It provides self drive car rental service at affordable rates in the country. Apart from this, it gives payback points on your every booking and you can redeem them for great offers. Hurry! Book a Mylescar today and earn 8 payback points for every Rs.100 spent. If you are still not happy with these discounts you can use the promo codes and other discount codes present on this site and save big on your every booking. Verified on 20/4/2019 .. Get flat Rs 550 discount on 38+ latest branded cars. This is applicable for First Time Users only nothing but new users. Applicable only for daily, weekly & monthly bookings. Offer not applicable in case the booking is cancelled. Use the above coupon code to get this. Stay tuned to get latest offers & discount codes for saving big on your car rentals. Hurry up!! Myles Car is giving away flat Rs 500 discount on self drive cars on this summer season. Book now and get the discount instantly. Choose from more than 38+ latest car models. This is valid for all new users. This Valid on daily and Weekly bookings only. Offers cannot be clubbed with any other promotion. Use the above Mylescars promo code to avail this offer. Rent a car today. Mylescars is giving away flat Rs 200 discount on car bookings. Applicable on minimum rental of Rs 1000 . Applicable for All Users .This is valid for all users. Apply coupon code at check out page to get this offer. Offer not applicable in case the booking is cancelled. The discount amount for all codes is applicable on the base fare only. Standing instructions/ pre-authorization will be made on the credit card based on the car type at the timeof pick-up or online in advance. Offers cannot be clubbed with any other promotion. Discounts can be redeemed in full & not in parts. Blackout dates apply. Check more details in the landing page. Get flat Rs 750 on car rentals for all users. Applicable on minimum amount of Rs 5000. Apply discount coupon code to avail this offer. Applicable on all major citites across india. Rent myles today. Verified on 20/4/2019 .. Get flat Rs 1000 on self drive car rentals for all users. Applicable on minimum amount of Rs 8000. Apply coupon code to get discount. Applicable on all major citites across india. Rent myles today! Verified on 20/4/2019 .. Mylescars is giving away flat Rs 500 discount on car bookings. Book now and get this discount on minimum car rental of Rs 2500. This is valid for all users. Apply coupon code at check out page to get this offer. Offer not applicable in case the booking is cancelled. The discount amount for all codes is applicable on the base fare only. Standing instructions/ pre-authorization will be made on the credit card based on the car type at the timeof pick-up or online in advance. Offers cannot be clubbed with any other promotion. Discounts can be redeemed in full & not in parts. Blackout dates apply. Applicable only for Daily, Weekly & Monthly bookings. Verified on 20/4/2019 .. Mylescars is offering flat Rs 600 discount for all its users (old and new). This is applicable on bookings done daily for weekly. Grab your favourite car from top demanded cars such as Maruti Ciaz, Honda City and Honda Amaze. Apply the given coupon code on the checkout page to get this discount. 1.Each Hotel Video Review gets you Rs 600 Paytm cashback and each Sightseeing Video Review gets you Rs 100 Paytm cashback! 2.App Download: To record your Video Review and win Paytm cashback download the HolidayIQ App. 3.Coupon Code: Coupon Code: To be eligible for your Myles cashback, enter MYLES-MobileNo (MYLES-xxxxxxxxxx) used while booking in the coupon code section. 4.Only approved hotel video reviews submitted via the HolidayIQ app are eligible for Paytm Cashback. 5.HolidayIQ reserves the right to approve or reject any video reviews basis authenticity as per its internal processes. 6.Only one video review per hotel and one video review per sightseeing per person is eligible for the cashback. 7.The offer is valid across all destinations for Hotel Video Reviews. 8.The Sightseeing Video Review Incentive offer is valid only in Alleppey, Thekkady, Kovalam, Pragpur, Kasauli, Shimla, Manali, Dharamshala, Dalhousie, Parwanoo, Mcleodganj, Solan, Port Blair, Ross Island, Havlock Island, Neil island, Gangtok, Darjeeling, Peiling, Lachung, Chikmaglur, Mahabaleshwar, Lonavala, Matheran, Alibaug, Panchgani, Lavasa, Auranagabad, Tarkalli, Agra, Mussorrie, Naintal, Dehradun, Kumaon, Yeracaud, Puri, Digha. 9.Sightseeing reviews posted for destinations other than mentioned above will not be eligible for the offer. 10.Users can avail a maximum of Rs 1500 in Paytm Cashback every 30 days. Check more details in the landing page. Book self drive cars for rent from mylescars in Chennai city. Choose from different cars like Hyundai, maruti ciaz, Honda amaze, Innova and more. Enjoy your vacation by visiting best places around Chennai. No coupon code required. Rent a myles today. Book self drive cars for rent from mylescars in Delhi city. Choose from different cars like Hyundai, maruti ciaz, Honda amaze, Innova and more. Take the care and enjoy your vacation by visiting best places around Delhi. No coupon code required. Rent a myles today. Book self drive cars for rent from mylescars in Pune city. Choose from different cars like Hyundai, maruti ciaz, Honda amaze, Innova and more. Take the care and enjoy your vacation by visiting best places around Pune. No coupon code required. Rent a myles today. Enjoy your ride. Book self drive cars for rent from mylescars in Hyderabad city. Choose from different cars like Hyundai, maruti ciaz, Honda amaze, Innova and more. Enjoy your vacation by visiting best places around Hyderabad. No coupon code is required. Rent a myles today. Verified on 20/4/2019 .. Book self drive cars for rent from mylescars in Mumbai city. Choose from different cars like Hyundai, maruti ciaz, Honda amaze, Innova and more. Take the care and enjoy your vacation by visiting best places around Mumbai. No coupon code required. Book Myles today. Get a drive today. Verified on 20/4/2019 .. Book self drive cars for rent from mylescars in Bangalore city. Choose from different cars like Hyundai, maruti ciaz, Honda amaze, Innova and more. Take the care and enjoy your vacation by visiting best places around bangalore. No coupon code required. Rent myles today. Are you looking to take a self try hook up? Just try Mylescars. It is now offering fabulous discounts and offers on car bookings. You can choose form vehicles like Campact SUV, suv, Sedan ,Muv, Luxury, hackback and many more. Services are available in cities like Delhi, Bangalore, Hyderabad, Noida, Mysore, Chennai, Goa and many more. Book Mylescars today and make your trip happy! Get 20% off on self drive booking at www.mylescars.com or the mobile application. Under the Offer, cardholder will get 20% off on booking made for self drive basis using Promo Code . Discount under the Offer will be calculated only on the base fare. Offer is applicable only from Monday to Thursday and not applicable on weekends (i.e. Friday to Sunday). Book and avail now! Rent a car through mylescars with out any security deposits. Choose from 38+ high variant models. Check more details at landing page. No coupon code is required to avail this offer. Applicable for all users. Hurry up and book now! Book self drive car with Mylescars and get exclusive discount of flat Rs 700 off. This deal is applicable only for new users. Applicable on daily and weekly bookings. Apply the promo code at the time of check out to redeem the discount. Valid on booking made between 31st March to 15th April. Valid on pick-up bookings made between 31st March to 15th April. Hurry!Limited Period deal! Are you looking for comfortable and affordable car bookings? Then just try Mylescars. Now Mylescars is presenting flat Rs 600 off on car booking. Minimum Booking of Rs 2000 has to be made to get this deal. Use the Mylescars coupon code at the time of check out to redeem the discounts. This is valid for both new and old users. Applicable on daily and weekly bookings and boooking made between 31st March to 15th April. Valid on pick -ups made between 31st March to 15th April. Hurry!Happy Booking! Good news for all the Mylescars users. Book now for Rs 4000 or above and get flat Rs 450 discount on your self drive car bookings. Use the coupon code at cart page in order to avail this discount. Available in all major cities like Delhi, Guragaon, Bangalore, Kolkata,Mumbai, Pune, Ahmedabad,Lucknow,Hyderabad, Amristar, Chandigarh, Goa, Chennai, Jaipur,Mangalore,Mysore, Noida and more cities. Offer not applicable in case the booking is cancelled. The discount amount for all codes is applicable on the base fare only. Myles Car is giving away flat Rs 700 discount to its users. This is valid for all Delhi-NCR & Mumbai users only. This is applicable for all its new and old users. This is valid for bookings made daily and weekly. Use the above coupon code to get this discount. Verified on 20/4/2019 .. Happy news for all Gurgaon Mylescar users. Book now and get flat Rs 600 discount on your bookings. This is valid for all old and new users. This is applicable on booking made daily or weekly. Apply the given coupon code to avail this rebate. Verified on 20/4/2019 .. Mylescars is giving away flat Rs 1000 discount on weekly and daily bookings in Chandigarh. Apply the coupon code to get this discount on your bookings. Applicable on bookings of Rs 6000 & above. This is valid for both old and new users. Hurry up!!! Unlock the sheer happiness as you drive away to your favorite destination with your loved ones. Yes, we are talking about taking a self drive ride. You can take a ride to your favorite place or next adventure in your favorite car whenever you find the roads calling with Myles. They are the fastest growing self-drive car rental service in India, which has its fleet spread over 21 cities across the country. Drive around and enjoy yourself with Myles that brings over 21 cities to be driven at the best prices. Why Myles? Because it has no restrictions in terms of kilometers to drive and has close to 38 higher variant models to choose from. This car rental service company has 250+ pickup locations. Whether you are searching for self drive cars Bangalore or planning a trip to Ladakh, Myles is the perfect answer. You can rent your self-drive cars from 38 various models available at their site. From compact SUVs, electric vehicles, luxury, MUV, sedan, hatchback to SUVs, Myles always has something for you. Here is a list of popular cars that you can self drive in - Renault Duster, Hyundai i10 Grand, Mercedes C Class, Toyota Innova, Maruti Dzire, Mahindra XUV, etc. Find the best promo codes available on Myles car hire in India today with HappySale. 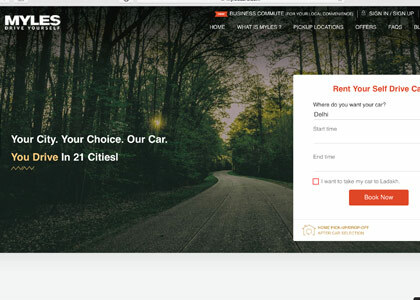 We help you find different promotional offers brought to you by one of the popular cars on rent service providers in India - Myles. Check out the first time user offer, special codes, more information about earning payback points with your every booking at this car rental service portal on this page.